Prison Hulk "SUCCESS", at Hobart, courtesy State Library of Victoria - image 0931291. AMONGST the most astonishing phases in the history of British colonisation in the nineteenth century have been the origin, rise, and growth of the great Australian Colonies from purely penal establishments. When Cook first examined the eastern coast of the new continent, the idea that came uppermost in his mind was the excellent site the harbour afforded for transplanting convicted criminals from England, where they would be at a safe distance for the rest of their lives from the land whose draconic laws they had offended. Such was the tenor of his recommendations to the Home Government, which, when acted upon, led to the foundation of the convict settlement at Botany Bay, and also of a future ; mighty nation. The feculent matter, thus placed under new, conditions, regenerated in a short time, to the amazement of the world. The seed, shot with the refuse, germinated into a vigorous, stately tree, covered, with bright, golden fruit. 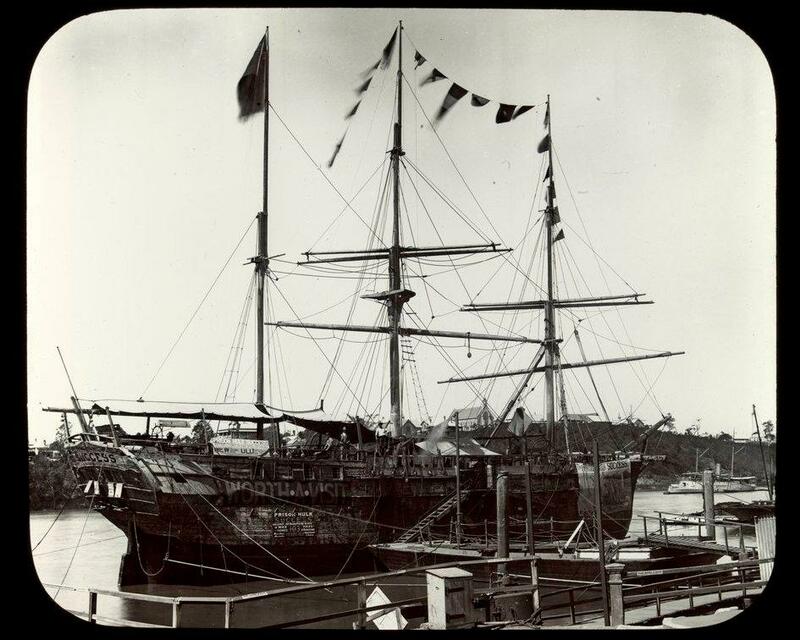 Prison hulk SUCCESS, between 1857 and 1918 Brodie Collection, La Trobe Picture Collection, State Library of Victoria. Image 068267. The colonists began very early to exhibit their dislike to the convict system, and made strong protests against the continuation of the transportation of British felons to Australia. Soon after Captain Lonsdale was sent to Port Phillip from Sydney to organise recognised authority in that newly-settled district the settlers, though few in number, determined to oppose the system. On August 8, 1849, the ship ‘Randolph' arrived at Port Phillip from England with convicts. The captain disregarded his instructions, which were to proceed to Sydney and disembark there. There was great excitement, in the settlement, and the colonists made preparations to resist the landing of the convicts by force. Their brave front induced the captain to alter his mind, and he took his ship and human freight to Sydney. Public meetings were held and resolutions passed objecting to Port Phillip being made a penal colony. The question next came before the Legislative Council of New South Wales, where Mr. Lamb moved, resolutions against convict transportation to Victoria, and they were carried without a division. The agitation then became general, and was kept up with great pertinacity by the Australian Anti-Transportation League, composed of delegates from the three Colonies. Ultimately, success crowned their efforts, and the Imperial Government abandoned the Colonies as receptacles for British convicts. Authentic records and reminiscences have conveyed to us accurate knowledge of the shocking treatment and brutalities perpetrated, under the garb of official authority, upon human beings in those dreadful days. The course of punishment was not wisely corrective or reformatory; it was simply inhuman in its barbarity, and could not have had the least mollifying influence on wretched beings treated worse than brute beasts, whose natures, under its extreme rigour, actually did sink into shocking animal debasement. In 1846, Mr. Pitcairn, a solicitor, of Hobart, wrote to Lord Stanley 'that the system Bows of the Success did not destroy the body, but polluted and destroyed the soul.' In 1845, the Rev. T. B. Naylor wrote to his Lordship, of Norfolk Island, ‘That the curse of Almighty God must sooner or later fall in scorching anger upon a nation which can tolerate the continuance of a state of things so demoniacal and unnatural. Official reports of various Governors, and private letters from time to time, exposed the shocking evil. Mr. H. P. Fry, in his book on penal discipline, describes the horrible character of the convict system at the different penal stations, the dark deeds and brutal vices committed in the coal mines by convicts, who were no less than fiends. It is recorded that 22,722 lashes were given to 516 convicts, in Tasmania, in the year 1846, for prevalent crimes. Out of 28,924 convicts on the island in 1845, 11,167 were charged before the magistrates for prison offences, and very few of these were innocent. Whilst the system had its defender, every right thinking man saw the folly of creating a state of society so threatening, the baneful effects of which still exist as a disturbing force in New South Wales. A new principle was accepted, namely, that offenders against the law must suffer punishment in the country where they committed their crimes; leaving it to voluntary emigration to ease the country of its worst elements. Transportation, under all these influences, became a thing of the past. An old writer of Tasmanian history and its prison discipline states that the convicts, if they behaved properly, were far better off than millions in Great Britain. Anyone can form his own judgment of the truth of that bold assertion by visiting the aged prison hulk ' Success’ a relic of that wretched past, which has been brought to Sydney Harbour for exhibition. The ancient craft has been an object of interest for the curious of Melbourne for some months, while moored off Williamstown. This vessel was one of a fleet of five purchased by the Victorian Government, and converted into floating prisons at the time of the gold rush in 1852, when the colony was overrun by an influx of ruffianism from other lands, and when there was not sufficient gaol accommodation for them. The vessels were stationed off Williams-town, at Gillibrand Point, where gangs of convicts were daily sent ashore with strong guards to work the quarries. Some of the most notorious malefactors known in our criminal annals were confined on the ' Success,' and she was also the scene of several outbreaks and murders by the desperate beings onboard. The Colonial Government adopted the same severe code of convict treatment followed by the Home Government. Illustrations of the hulk are given on this page. The first represents the 'Success' lying at her moorings, the second shows her figure-head and cutwater, and the third depicts a portion of 'tween deck cells. The fourth shows a strongly-barred enclosure bearing the significant title of the 'Tiger's Den’ which is very suggestive of the wild creatures, no longer human, that were securely confined within that degrading receptacle. 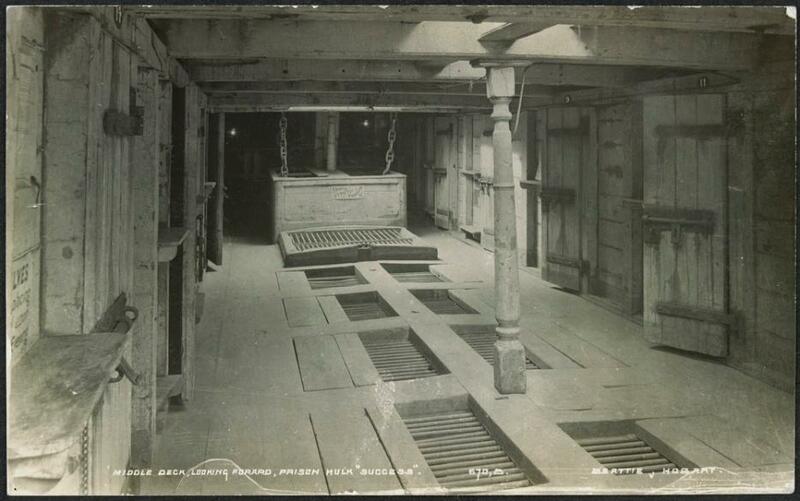 Lay figures of noted criminals, with the clothing and chains they actually wore, are exhibited in cells on the lower deck. There is a group of wax figures representing the murder of Colonel Price, and another of the Kelly Gang. Officers Quarters Prison Hulk "Success" ca. 1900-ca. 1925 by John Watt Beattie 1859-1930, photographer. Image 391232, courtesy State Library of Victoria. •	1840's Made three voyages with emigrants to Australia. •	1857 Prisoners from the Success murdered the Superintendent of Prisons John Price, the inspiration for the character Maurice Frere in Marcus Clarke's novel For the Term of His Natural Life. •	When no longer needed as a prison ship as such, the Success was used as a detention vessel for runaway seamen and later as an explosives hulk. •	1912 Crossed the Atlantic and spent more than two decades doing the same thing around the eastern seaboard of the United States of America and later in ports on the Great Lakes. •	1918 Returned to commercial service with an auxiliary engine being fitted, but sank after being holed by ice. •	Refloated and returned to use as a travelling museum ship. Threads collected and collated by A J Guesdon, 2014. Convict Ship Success at Circular Quay West, 1 January 1890, courtesy National Library of Australia.